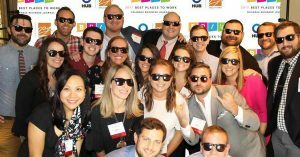 Raleigh, NC – Personify has been named to the Triangle Business Journal’s “Best Places to Work” list for the third consecutive year. Based on employee survey responses, Personify ranked among the top midsize companies to work for in the Triangle. The company attributes their recognition to their revamping of internal process that led to the creation of six new committees in 2017: ethics, innovation, community outreach, new employee immersion, corporate wellness, process improvement, and culture. These committees are structured to empower employees to enact real change at all levels of the company, while fostering an environment that drives them to be the best versions of themselves. The work of these committees allows Personify to stay in an ongoing state of continuous improvement, while giving employees at all levels the ability to influence the business. When asked to describe a unique workplace feature Personify offers to employees, Madison Cochran, 3rd year Client Services Coordinator with the company, answered: “The unique Personify ‘vibe.’ From our outside patio used for company cookouts, to the 20 foot digital wall and the DJ booth where our full time ‘DJ Triple B’ spins on Monday mornings and Friday afternoons, to the office decor that includes a living wall and rotating pieces featuring local artists for ‘First Friday,’ the combination of these features promote collaboration and innovation, while also embracing our dynamic culture. In an effort to reason scores even higher next year, Personify will continue to strive to not only revolutionize the recruiting industry, but also simply improve the way business is done, externally for clients and internally for employees. For more information on Personify’s unique company culture, click here. Juggling school and a job can often prove as a difficult challenge for full-time students.